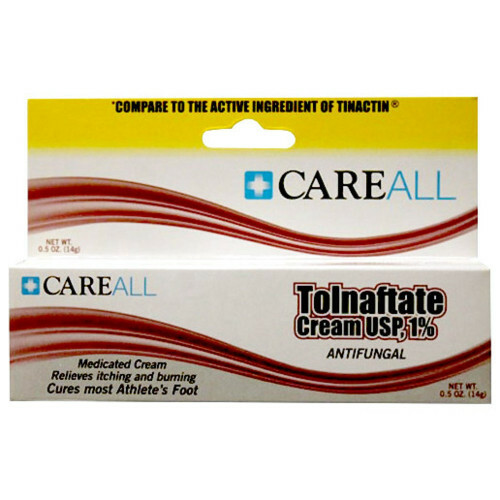 The CareALL Tolnaftate Antifungal Cream helps treat issues that may be irritating and itching, such as athlete's foot (tinea pedis), ringworm (tinea corporis), and jock itch (tines cruris). The CareALL AF5 Tolnaftate Medicated Cream provides soothing relief for itching, scaling, discomfort, burning, and cracking of the skin. This medicated cream is not effective on the scalp or nails. For treatment of rashes and minor skin irritations, you may prefer the CareALL Hydrocortisone Anti-Itch Cream.